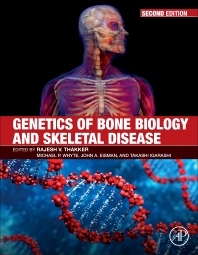 Genetics of Bone Biology and Skeletal Disease, Second Edition, is aimed at students of bone biology and genetics and includes general introductory chapters on bone biology and genetics. More specific disease orientated chapters comprehensively summarize the clinical, genetic, molecular, animal model, molecular pathology, diagnostic, counseling, and treatment aspects of each disorder. The book is organized into five sections that each emphasize a particular theme, general background to bone biology, general background to genetics and epigenetics, disorders of bone and joint, parathyroid and related disorders, and vitamin D and renal disorders. The first section is specifically devoted to providing an overview of bone biology and structure, joint and cartilage biology, principles of endocrine regulation of bone, and the role of neuronal regulation and energy homeostasis. The second section reviews the principles and progress of medical genetics and epigenetics related to bone disease, including genome-wide association studies (GWAS), genomic profiling, copy number variation, prospects of gene therapy, pharmacogenomics, genetic testing and counseling, as well as the generation and utilizing of mouse models. The third section details advances in the genetics and molecular biology of bone and joint diseases, both monogenic and polygenic, as well as skeletal dysplasias, and rarer bone disorders. The fourth section highlights the central role of the parathyroids in calcium and skeletal homeostasis by reviewing the molecular genetics of: hyperparathyroidism, hypoparathyrodism, endocrine neoplasias, and disorders of the PTH and calcium-sensing receptors. The fifth section details molecular and cellular advances across associated renal disorders such as vitamin D and rickets. Rajesh Vasantlal Thakker FRS FMedSci FRCPath FRCPE FRCP is May Professor of Medicine in the Nuffield Department of Clinical Medicine at the University of Oxford and a Fellow of Somerville College, Oxford. Thakker is also a Consultant physician at the Churchill Hospital and the John Radcliffe Hospital, Principal Investigator (PI) at the Oxford Centre for Diabetes, Endocrinology and Metabolism (OCDEM) and was Chairman of the Efficacy and Mechanism Evaluation (EME) Board until Spring 2016.